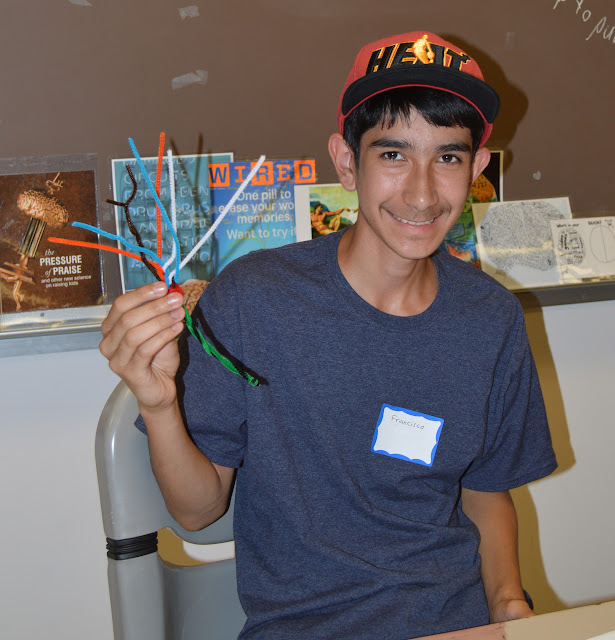 Last week, 24 middle school students joined us for the 2016 Bloomin' Brains Summer Camp. We started with an interactive lesson about neuroscience and examined real human brain specimens. Then we formed teams to go on a competitive Auditory Treasure Hunt. Of course, campers had to make plant extractions to test on planaria and lumbriculus worms. Some favorite activities were tie dyeing T-shirts and scarfs, making plant presses at the Herbarium and trying out the EMG-controlled gripper on a trip to the Center for Sensorimotor Neural Engineering. Watch Kristi Straus on King5 TV discussing sustainability. Registration for summer 2016 Bloomin' Brains is closed and all slots are filled. The Sowing the Seeds of Neuroscience staff is excited to meet the new campers this summer for a week of plants and brains! After spending about 10 days in Bylakuppe, India, I found a small shop selling essential oils. One that I had not heard of before was "neelgiri oil." I will bring it back to the lab to test on our bioassays. Neelgiri oil is made from the eucalyptus plant and may work to reduce inflammation. 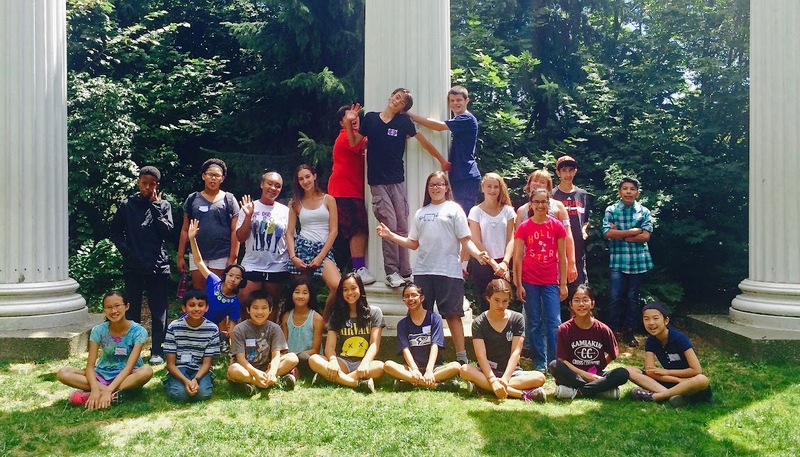 Earlier this month, 23 middle school kids attended the Bloomin' Brains Summer Camp at the University of Washington. The camp is part of our Sowing the Seeds of Neuroscience program funded by the National Institute on Drug Abuse. The kids started camp with an overview of the week including safety rules and expectations. The camp staff and each of the campers then introduced themselves. We played a game of "snowball" to get everyone talking to each other. Dr. Chudler also brought in several medicinal plants and herbs from his home garden for the kids to smell and draw in their lab notebooks. Many of the kids were able to identify the plants. "Brain 101," an overview about the brain and neurotransmission followed. We played the neurotransmitter game and created a giant nerve cell model. After lunch, we had the auditory treasure hunt where the campers explored the University of Washington campus. The afternoon ended with the construction of brain and neuron models from playdoh, pipe cleaners and a favorite...beady neurons! 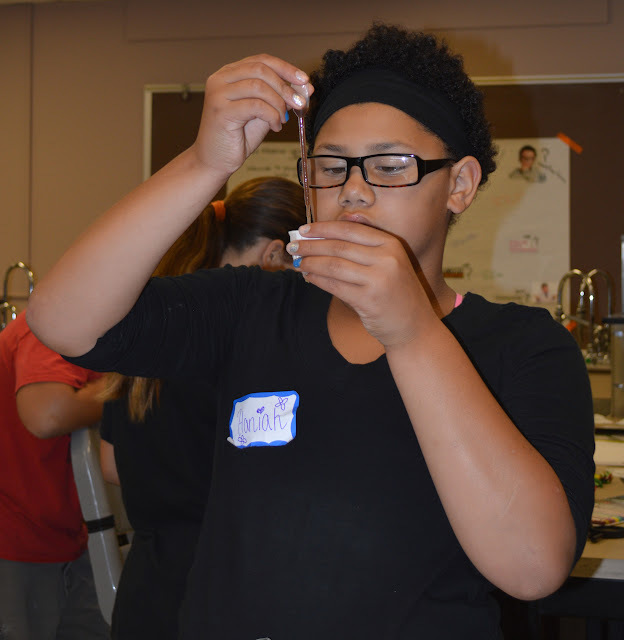 Day 2 of Bloomin' Brains Summer Camp included chemical extractions from plants, a trip to the UW Medicinal Herb Garden, a Latin lesson, hand-eye coordination game and more questions and answers about the brain. Day 3 started with a few brainy puzzles, then moved to experiments that examined how plant extracts affected the behavior of planaria. 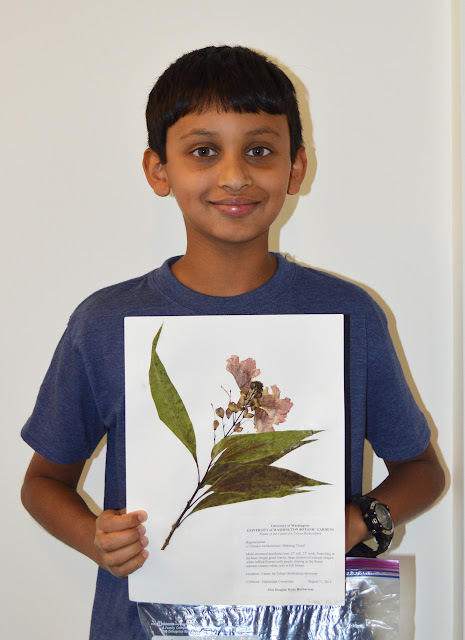 The kids also took a long hike to the Hyde Herbarium to make presses of plants and had lunch. Back in the lab after lunch was shirt and scarf tie dye time. On the fourth day of camp, the kids studied Lumbriculus worms to see how plant extracts affected blood flow. We also had a guest presenter who taught the campers how to make different scents from essential oils. The final day of camp started with spikerboxes that were used to listen in on the neural activity from cockroach leg nerves. Everyone also made an herbal first aid kit. In the afternoon, we took another hike, this time up to the "Quad" for an outside lunch and then to the Center for Sensorimotor Neural Engineering to learn about brains and machines. After a snack of brain jello, it was time to say goodbye. We think all of the kids had a fun time at the Bloomin' Brains Summer Camp. Much of the success goes to the NeuroSeeds staff and undergraduate assistants who made sure that the kids were on task. UW Brain Awareness Week Open House is a great success! On March 3rd, 2015, over 600 elementary and middle school students attended the Brain Awareness Week Open House at the University of Washington. Students got to participate in activities such as holding a real human brain and trying to play catch wearing prism goggles, and heard a lecture from Dr. Chudler. The Neuroseeds team hosted a table where students tested 8 different Essential Oils to see if they could correctly identify the scent. Students were then asked if they knew the effects the different plants and herbs had on brain activity. Students generally knew the how coffee and lavender affect the brain, but were surprised to find out that grapefruit essential oil can help with depression, and clove oil can help with sleep! Students also had an opportunity to try the Neuroseeds Planaria Movement activity where they first tracked their movement in water, then in an herbal extract of coffee, black tea, green tea or chamomile, and noted whether there was a difference in the speed and type of movement. The enthusiasm was contagious as students took turns looking through the magnifying glass, clicking the counter to track movement, and reporting their data. Interested in planaria regeneration? Here is some crazy new research....Planaria can store memories outside of their brains! Scientists from Tufts University raised some planaria in a container with a rough floor and others in a container with a smooth floor. They then did an experiment to see how quickly the planaria (which naturally avoid light) would move to eat liver in the brightly-lit section of a container with a rough floor. The animals raised in the rough-floored container overcame their aversion to light more quickly and spent more time feeding on the liver. Now comes the crazy part. Scientists decapitated all the planaria and housed them in a smooth-floored container while their heads regenerated. Two weeks later the animals were tested again. The planaria that were originally raised in the container with the rough floor fed more quickly in the brightly lit section. They apparently remembered that the rough floor was a safe place to feed....even though the brain (and the whole head) of those animals was entirely generated while they lived in a smooth-floored container. Where and how was this memory stored? How was it recalled? There is more research to be done! To read more details, check this out. Happy New Year from the Neuroseeds Team. If you are looking for a healthy New Year's Resolution, adding turmeric to your food might be a good one! Turmeric is a plant in the ginger family that is used extensively in Indian cooking--this plant gives both Indian curries and American mustard their distinctive yellow color. Turmeric also plays a major role in Ayurvedic medicine and is currently being examined in the west t o determine its efficacy for treating a myriad of diseases. The primary active chemical in turmeric is curcumin. Scientific research with promising results has been conducted about curcurmin/ turmeric on : breast and pancreatic cancer, arthritis, Alzheimer's disease, and more. A 2007 review indicates that curcumin has at least ten neuroprotective actions and it may be used to prevent or treat neurodegenerative diseases such as Alzheimer's, Parkinson's, and stroke. Yesterday's Science Daily, presents work showing that curcumin can enter the brain and destroy the beta-amyloid plaques responsible for neuron loss in Alzheimer's disease. Interestingly, the scientists involved in this research used a curcumin aerosol that could be breathed in, rather than eaten. The NIH suggests that turmeric consumption in food is safe for most adults. For more information about turmeric, click here. Can chocolate be good for us? Research published in the journal Nature Neuroscience just found that people who drank cocoa high in an antioxidant called flavanols did better on a memory test than people who drank low-flavanol beverage. The people in this study were healthy folks between 50 and 69. After three months, people who drank the high-flavanol cocoa each day did about 25% better on the study's memory tasks. This improvement means that the high-flavanol drinkers performed like people several decades younger on the memory tasks! In addition to improved memory skills, in an fMRI brain scan, the high-flavonol drinkers showed increased function in the dentate gyrus. The dentate gyrus is part of the hippocampus whose function declines with human aging. This decline is thought to be partly responsible for age-related memory decline. Two caveats about this study: 1) This was a small study (only 37 participants) that should be repeated in larger trials to understand the generality of this finding and 2) You would need to eat A LOT of chocolate (about seven bars of dark chocolate every day) to get the daily dose of flavanols. If you want to read more about this study, check out this New York Times or this Scientific American article. 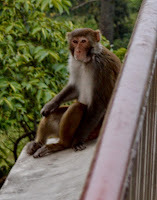 Dr. Chudler has returned safely from India, where he taught for the Science for Monks program. My last day of teaching focused on memory and learning and consciousness. First, I discussed early experiments to investigate learning such as Ivan Pavlov’s classical conditioning experiments and B.F. Skinner’s operant conditioning. I mentioned the different types of memory (sensory, short term and long term memory) and the importance of the hippocampus to get short term memories into long term memories. I also showed a picture of an Aplysia, the animal that was used by Eric Kandel to demonstrate how neurons change when learning occurs. No discussion of memory is complete without a description of “HM,” the patient who suffered from anterograde amnesia after his hippocampus and surrounding brain were removed during surgery for epilepsy. This discussion helped the monks understand the importance of the hippocampus in the consolidation of memory. To illustrate various principles of memory, we played some memory games. For example, I had the translator read a list of words associated with “sleep”, but the list did not include the word sleep. When I asked how many people remembered “sleep,” almost all of the monks said that “sleep” was on the list. This demonstration showed how false memories could be introduced and that memory is not like a event recorded on tape. We also played the “Who’s Missing” game where the monks formed a circle with one monk blindfolded in the middle. Another monk left the room and the blindfolded monk had to identify who left the room. Finally, we demonstrated learning of space by blindfolding one monk and placing a ball in the middle of a large circle. We timed how long it took for the monk to find the ball. We placed the ball back in the same location and had the monk find the ball again. It was easy to see how a mental map was formed because it took less and less time to find the ball each time the monk tried to find the ball. After tea, our discussion turned to consciousness. I approached consciousness by talking about sleep, hypnosis and drugs. Most of my talk focused on sleep and dreaming, but I was able to dispel some myths about hypnosis and introduce the mechanisms by which drugs affect the brain. But to be honest, this presentation was rushed because I had little time. Today we finished up the basic anatomy of the brain: right and left hemispheres, gray and white matter, the parietal, occipital, temporal and frontal lobes. We also discussed the brains of other animals by first looking at some slides from the Comparative Mammalian Brain Museum. The monks were challenged to guess which brain belonged to which animal. Then we tried it again with cards. Groups of five monks were each given a set of cards containing different animals and different brains. Each group had to match the animal with the brain. It took a few tries, but the monks were able to use the scale bars and their new knowledge about neuroanatomy to find the matches. After tea, each monk made a brain hat from a print out of the right and left hemispheres. First, the monks colored the four lobes of the brain and then they cut out each hemisphere and taped them together. The activity would have been easier if the print outs were labeled in Tibetan, but they all had fun constructing their hats. In fact, most of them wore their hats at lunch. I made a hat too, but I did not wear it to lunch. 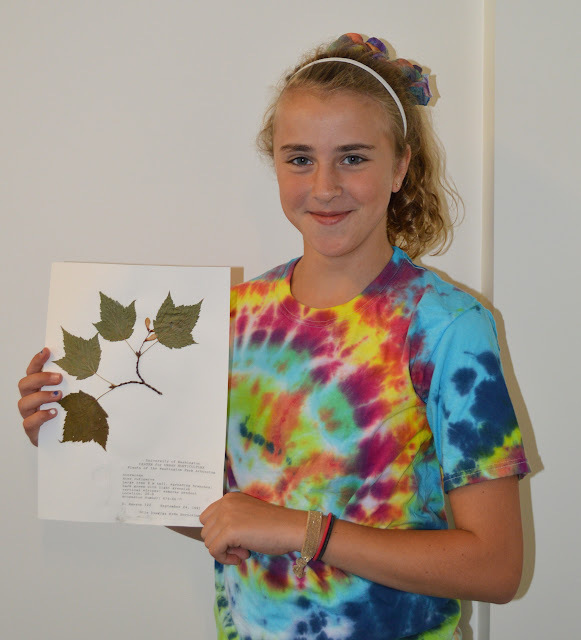 We have received the preliminary data from our Summer '14 Bloomin' Brains summer camp, and it is very positive! Students reported that they feel more confident doing science as a result of the camp, felt really engaged with science during the camp, and that camp made them excited about studying science in the future. They also learned a lot about Neuroscience, how to conduct experiments, and about careers in Neuroscience. "I gained insight into how neuroscience concepts can seamlessly be introduced to middle school students effectively where most can access main ideas. I am now armed with an interesting way to cover the nervous system other than the rote memorization of anatomy." "One of the most important things that I realized is that there is a wide spectrum of things that affect brain/nervous system function. I think this is a powerful concept for students to learn and think about for their own health, function, etc." We are happy to be able to support teachers in their efforts to expand the ways that their students experience and connect to Neuroscience and how it applies to their own lives. We are excited to report that six teachers from as close as North Seattle and as far away as Santa Cruz, CA are up and running this fall with the Sowing the Seeds of Neuroscience curriculum! By the end of next week, all eight of our Fall 2014 teacher cohort will be in some stage of the curriculum. Each teacher will be using it differently, tailoring it to the needs and interests of his or her students. Our teachers never cease to amaze us with their creativity and passion for helping their students understand the material and get excited about science. This week one of our teachers, Beverly Ferguson from Hazel Wolf K-8 in Seattle, wrote a song about the parts of the neuron and taught it to her students. Just another way to learn about the brain. 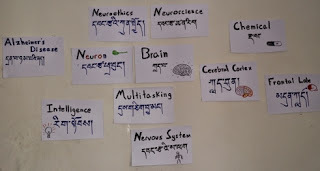 We encourage all who are interested in the Sowing the Seeds of Neuroscience project to join our Neuroseeds Facebook page at: https://www.facebook.com/groups/720879554589950/. And stay tuned for our new Twitter and Instagram posts! It has been a busy summer! In July we held our annual Bloomin’ Brains Summer Camp. 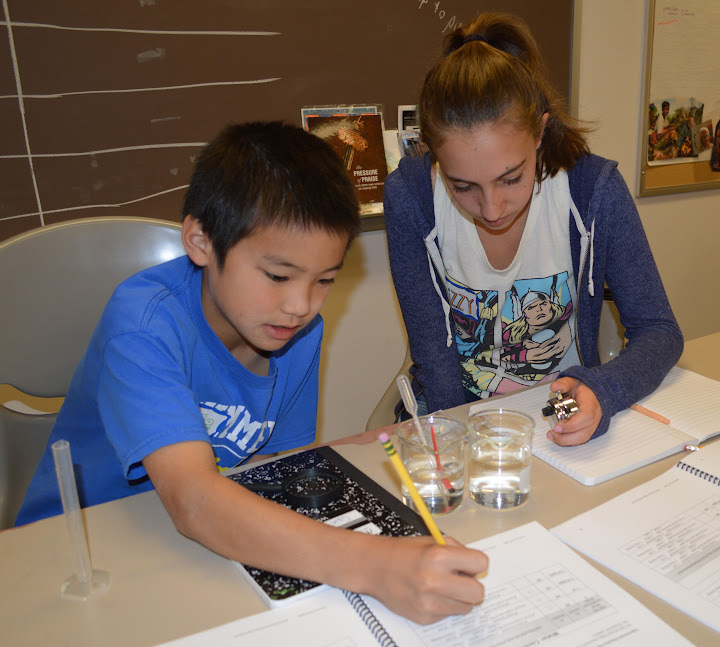 A total of 27 middle school students from around the Puget Sound area participated in a variety of activities related to the Sowing the Seeds of Neuroscience program. Campers performed experiments, took field trips, created art projects and played games as they had fun learning about the brain. Campers also made an herbal first aid kit and created their own scent using essential oils and tie-dyed T-shirts and scarves. At the beginning of August, eight teachers participated in our 2014 Summer Teacher Workshop. Teachers came from the Seattle area as well as our first teacher from California. 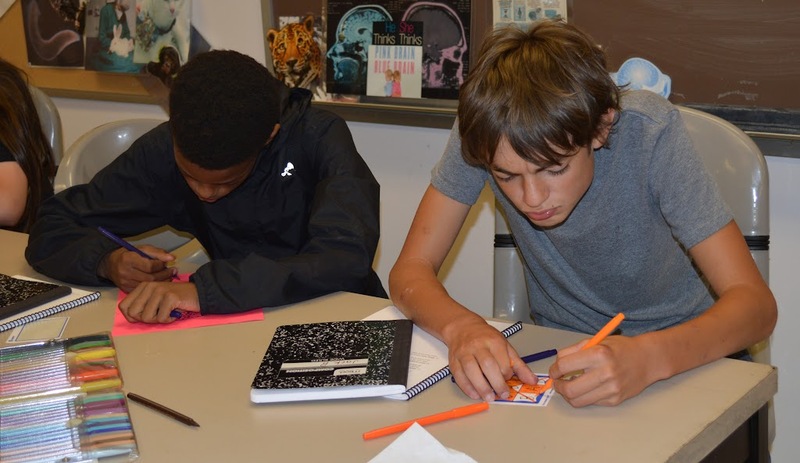 The teachers were “students” for a week as they worked through the curriculum lessons, visited the UW Herbarium, discussed the ethics of animal research, and created brain-themed art projects. There was a lively discussion on the challenges of encouraging students to consider STEM careers and fostering their interest in science, especially for low-income students and under-represented students. We are excited to add these new teachers to the community of educators who are bringing Neuroscience to their middle school science classrooms! New Study: Cinnamon may be used to halt the progression of Parkinson's disease. Saw this book in a window display at a used bookstore in the University District (Seattle, WA). I (Eric C.) am growing potatoes outside in my small home garden and have also started one potato inside using the old toothpick-and-water method. So, what, you may ask, do potatoes have to do with neuroscience? It turns out that potatoes contain a neurotoxin called solanine. Don't worry -- potatoes are safe to eat. The amount of neurotoxin in potatoes is usually very small and the chance of poisoning is low. Most potatoes that you buy in the store contain only a little solanine. Solanine is concentrated in the skin and "eyes" of the potato, so peeling a potato removes much of the neurotoxin. Also, the amount of solanine increases when potatoes are exposed to light and when they turn green. So, potatoes should always be stored in a dark place. A few outbreaks of potato poisoning have been reported, but people rarely die. Typical symptoms of solanine poisoning include headache and stomach problems; severe poisoning can cause convulsions, breathing problems and coma. Solanine works by blocking the enzyme that breaks down the neurotransmitter acetylcholine. Therefore, solanine causes an increase in the amount of acetylcholine in the body. Kristi and Marcia presenting a poster about the Neuroseeds project at the NIH SciEd 2014 meeting in Bethesda, MD. Now that spring has arrived, the herbs are returning. Here are some early photos of some herbs from my (Eric C.) home garden. By the way: many herbs are very easy to grow. If you are looking for herbs that take little care, I recommend lemon balm, oregano and peppermint. But if you are not careful, these herbs can take over your entire garden! We had a great time at Brain Awareness Week on March 4th. What an exciting event! More than 650 middle and elementary school students came to the UW to learn about how the brain works through a presentation by Dr. Chudler and about 20 hands-on exhibition tables. Neuroseeds was there too. 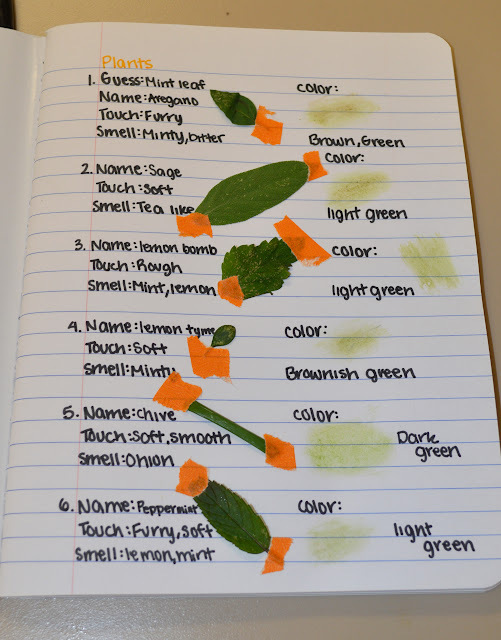 Kristi showed students examples of different medicinal and neuroactive plants and let them smell different essential oils and guess what they were. Elischa had students do the planaria move ment assay. The kids and the exhibitors had a great time! Neuroseeds is now on Facebook! Like us, follow us, share photos, get support, ask questions. Let us know how you are doing? What is working for you? What have you modified? We are working a lot with our cockroach leg nerve SpikerBox assay right now, trying to get good consistent data. The preliminary data are EXCITING! We put the cockroach leg on the SpikerBox and take a background reading on the number of action potentials ("spikes") per second and then add cayenne. After adding cayenne, sometimes the number of spikes increases dramatically, decreases even more dramatically, and then recovers to baseline levels. It is very exciting. However, we don't get these results consistently. Sometimes we only see a small change. Elischa and I have been working hard in the lab trying new ways of adding cayenne to make this more consistent...bathing the leg, poking a few holes in the leg, and most recently, cutting a "window" out of the cockroach's exoskeleton to ensure that the cayenne extract penetrates. We are also planning to try clove this week. Alas--it seems that the planaria are able to remove the methylene blue from their systems. When they are removed from the methylene blue, they slowly recover their original (brownish) color. As such, this will not be a useful way to differentiate old from new tissue in the regeneration experiment. Look! It works! Robert turned this planaria blue. It took longer than we expected, but methylene blue is definitely incorporated into the planaria body. Yesterday, he cut the planaria in half to see if we can use this dye as a way to differentiate the old from the new tissue. We don't know what will happen but will keep you updated. We've started a new experiment in the Neuroseeds Research Lab. Robert has studied histology (the microscopic examination of thinly sectioned and stained tissues) and had the creative idea to use a histology stain (methylene blue) to dye the planaria. This is not just for fun :) The goal is to dye the planaria blue so that when we do regeneration experiments, we can easily tell old (blue) from new (pale brown) tissue. Currently, we are looking at different concentrations of methylene blue to determine what concentration will dye them but not kill them. The image below shows our experimental setup. In each well, we have a planaria exposed to a concentration of methylene blue. The numbers indicate the concentration: 1 drop in 20 mls, 1 drop in 30 mls, 1 drop in 40 mls, or 1 drop in 100 mls. We have two controls (no methylene blue) and we have run most concentrations in triplicate. Why do you think we included these aspects of the experiment? I had the privilege of observing Karen Cole's class at St. Louise School in Bellevue. Karen is teaching the Sowing the Seeds of Neuroscience curriculum as an elective class to nine students. The students were excited to be extracting plant extracts from coffee, green tea, comfrey, and chamomile. They were engaged, listening, asking questions and trying hard to follow directions. It was a treat to see the lessons in action! These photos display their work from previous weeks: A pipe-cleaner neuron model and a playdough brain model. When I asked students what they liked about this class, they said, "It is fun to hear about how our brains work" and "We get to actually do stuff every time in class. Not sitting and listening." We are busy in the lab packing up our kits to go out into six schools this Fall and finishing up the edits on our curriculum. However, we always have time for science! Right now, we are using the Matlab program that Luke wrote and trying to get good, quantitative data from our SpikerBox experiment. We are counting the number of action potentials per second in a cockroach leg--with and without the addition of cayenne pepper extract. Preliminary data are REALLY exciting! In July, middle school kids had their time at summer brain camp; this month, middle school teachers had their turn. At the University of Washington Neuroseeds Summer Teacher Workshop, 11 teachers spent a week learning how to use the newly developed lessons about neuroscience and plants. During the school year, the teachers will check out kits with all of the supplies and equipment necessary for their students. where everyone gets an object and they have to list ways that the object is similar and different from the brain. Campers had lunch and then had a guided tour of the University of Washington Medicinal Garden and Botany Greenhouse. The first day ended with campers making their own herbal first aid kit. The students made plant extractions the second day. These extractions would be used later in the week to test their neuroactive properties. Everyone hiked over the Hyde Herbarium for lunch and a tour. After the return hike back from the Herbarium, each camper tie dyed a T-shirt and took turns dyeing one of my white lab coats. 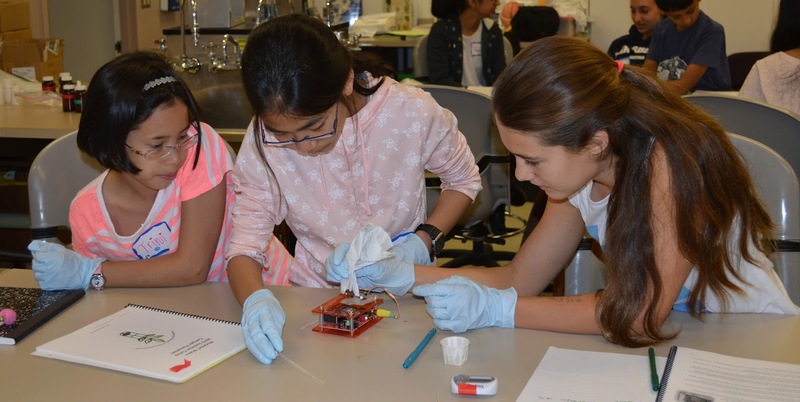 On day 3 of camp, students discussed the ethics of using animals in research and then tested their extractions on movement of planaria (flatworms). We had lunch outside just south of the university fountain. Because we went back to the lab, campers were divided into four teams for a "Sensory (Hearing) Treasure Hunt." During this treasure hunt, teams explore campus listening and recording different sounds. Teams compete to find sounds that none of the other teams found. We ended the day by building brain and neuron models from clay, string and pipe cleaners. We started day 4 outside where campers drew pictures or wrote poems about their own brains and what made them special. Back in the lab, campers brought out their extracts again and tested them on the heart rate of Lumbriculus worms. After the lab, we headed back outside for lunch and then a game of "Synaptic Tag." In the afternoon, campers mixed essential oils to create their own unique scents. The final camp day started with Spiker Boxes. Spiker Boxes are used to record action potentials from the nerve of a cockroach leg. Campers got into pairs and took on the jobs as a surgeon or a recorder. The campers also tested their extracts to see if the chemicals cause the neural activity in the nerve to increase or decrease. The students took another hike to visit the Center for Sensorimotor Neural Engineering (CSNE) to work with many games, demonstrations and activities about neuroscience. Finally, after a fun-filled, scientific week, camp came to a close. Some of the students asked if they could come back to camp next year, but we will give a new group of kids a chance to explore neuroscience. Last week, I (Eric Chudler) attended a conference in Omaha, Nebraska. The organizers of the meeting arranged a trip to the Omaha Zoo and Aquarium for everyone after the second day of the conference. The zoo kept the aquarium and the tropical house open for us after the general public had all left. As I entered the tropical house, I noticed a display (see photo below) about how plants in the tropical forest are the source of many medicines. The world is filled with many plants that provide drugs to treat disease; the medicinal properties of some plants are still unknown. 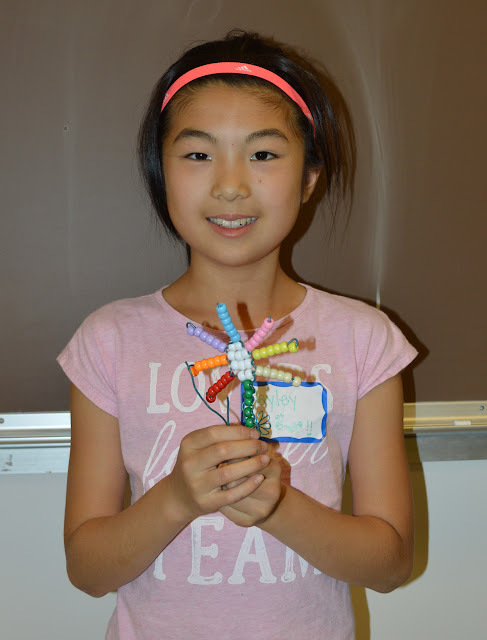 Students for the "Bloomin' Brains" Summer Camp and teachers for the Neuroseeds Workshop have been selected. These two summer programs should be a lot of fun for everyone. Also, supplies and equipment for all of the Neuroseeds Lessons are now in the classrooms of the six teachers who participated in last year's workshop. Approximately 1,000 students will be working with the materials and we will report on the success of the program when we receive evaluation reports back from the teachers. Test tubes, beakers, herbs, spikerboxes, cylinders, and much, much more! That's right, the kits are complete: everything teachers need to use the Sowing the Seeds of Neuroscience lessons in their classroom in four bins. Teachers who attend the 2012 summer workshop can now check out the kits to use with their students. If you are a teacher who would like to use the lessons in your classroom, you must first attend a workshop. On March 5, 2013, the Neuroseeds team participated in the University of Washington Brain Awareness Week Open House. Approximately 650 students from local elementary, middle and high schools attended the event. Kristi, Luke, Pranav and Marcia set up an exhibit including spikerboxes and a display of medicinal plants and herbs. Watch the video below to get an idea of the excitement about learning science. It has been a busy few weeks completing experiments, finalizing the lessons, and collecting all of the equipment and supplies for the kits. On Feb. 2, we had a kit packing party when we assembled the materials needed to teach the Sowing the Seeds of Neuroscience lessons. The kits will be available to teachers who attended the summer 2012 workshop. These teachers will check out the kits, deliver the lessons to their students, and return the kits so they can be checked out by other teachers. New teachers interested in using the kits should apply to attend the Summer 2013 Sowing the Seeds of Neuroscience workshop. The application for the workshop will be online soon! Brine shrimp hatched! It doesn't look like a great hatch (less than 50% of eggs hatched), but I am grateful to have some Artemia salina babies. I divided the flask into two flasks. Both have a bubbler for extra oxygen and a light--but one flask will be fed nanno and the other will be fed yeast. We'll see what happens. We are back in the brine shrimp business. I started a culture on 11/7/12 using conditioned water and enough non-iodized salt to get to about 35ppt (1.025-1.026 specific gravity). I kept a bubbler on them and kept a light on around the clock. Alas and alack, they did not hatch. Today I collected some water from Lake Washington and I am going to try the same protocol to see if I can get them to hatch. Brine shrimp ("Sea Monkeys") are hatched by kids all over the country--we should be able to succeed at this! We have been working on chromatography in the lab again lately. Chromatography is a technique to separate mixtures--we are using it to separate different compounds found within one plant extract. As an introduction to the lesson, we do chromatography on markers. In lab today, I tried multiple colors of Mr Sketch and Sharpie Flip Chart markers to determine which worked the best--so we can decide which markers to include in the kits. Here are some pictures of the process and the results below. From left to right, this is what is happening. All of the supplies are laid out on the lab bench. I have colored a stripe 2cm up from the bottom on each piece of filter paper. On the top, I have used the marker to label an M for Mr. Sketch or an S for Sharpie--this will also give us information about the color of the marker. The filter paper strips are in the test tubes. In the bottom of each test tube is water. As the water moves up the paper (due to diffusion), different pigments in the ink are carried at different rates (due to molecule size and polarity). This picture was taken after 15 minutes. After 45 minutes, this is what we got! Overall, I think that the black is the best, but the green and orange are pretty good too. The pigments traveled faster with the Sharpie markers, and both separated well, so we will use Sharpie! Another planaria experiment completed. We tested centella (also called gotu kola) because this herb is used to help would healing--especially connective tissue health and scar prevention. As detailed below, Pranav tested 1.5%, 3%, 6%, and 12% centella extract--but tried this in triplicate. So each concentration was tested on three different planaria. We think this is a better system because it will help us to tease out individual differences vs differences caused by the herbal extract! No animals died in this experiment, but we didn't see any differences between the treatment and the controls. All animals were starting to develop eyes by four days. It is really hard to determine whether there are differences when all the animals develop eyes so quickly and we only check once a day! I think that this is temperature related, so we might try to reduce the lab temperature and see what happens. We had a great lab meeting today. We all updated one another on what we've been up too, and we all listened to action potentials ("spikes") in cockroach legs on SpikerBoxes. It was great to have the four of us working together and sharing ideas about how to quantify and visualize the spikes. Shaun also came in recently to show off his progress. He is using the Ardruino system to quantify the action potentials. This has serious potential but still needs some work--and it is still very clearly in development--check out the tangle of spaghetti wires below! Pranav checked the planaria twice on Saturday and final results from this planaria experiment are in. All planaria in 25% and 50% solutions of extract died, as did the planarian in the 6.25% centella. All other animals developed eyes by Saturday evening 10/27/12. However, the centella at 12.5% developed eyes earlier than all other animals--by Saturday morning. Is this significant? We don't know. Is it repeatable? We don't know. To find out, Pranav is going to start another experiment. In this experiment, he will test only centella, but he will test it at four concentrations: 1.5%, 3%, 6%, and 12%. (Note that in all cases, this is some % of a 5% solution). He will also test each treatment in triplicate...so if we find differences we will be able to tease out whether this is just variation between animals or if it really seems to be due to the extract. We will try this same thing next week with Gingko and Plantain. I love science! While travelling in Japan, Eric came across this stunning image of Daphnia at a Tokyo coffee shop. Enjoy! First results are in from the Planaria regeneration experiment. The 50 percent concentration of all three extracts killed the Planaria in less than 24 hours. 25% of gingko also killed the planaria and 6.25% of Centella. That 6.25% is a surprise.....we'll need to look at this again. Some of the controls are clearly more healed at the cut site than Planaria in the extracts. However, the planaria in the 6.25% and 12.5% gingko conditions look great--their cuts are very healed and we can already see signs of growth. Exciting! Busy day in the lab today! Pranav started a Planaria regeneration experiment using Centella, Gingko, and Plantain. A 5% decoction of each of these herbs was tested at four concentrations: 6.25%, 12.5%, 25%, and 50%. Of course, we've also tested a control in each plate. The goal is to determine if any of these herbs changes the rate of regeneration of the Planaria. In addition, Luke tried out the spiker box. He didn't test an extract but just got familiar with the tool--and started to think about quantification using the audio-editing program Audacity. It is possible for us to record spikes using smartphones and then email the file. When opened in Audacity, we can theoretically count spikes over a 10 or 20 second period and compare those.....this needs work but has potential. Shaun is also working on a way to quantify spikes using LED lights....but we haven't seen it in action yet. So much to do! Eric bought some earthworms on his way to work today and tried using them with the Spiker Box. It is clear that the cockroaches are a better animal model for this tool. We tried both earthworms and cockroaches with a 5% cayenne decoction. In cockroaches, there is a very clear decrease in spikes after a few minutes. There may also be an increase in spikes during those first 3-5 minutes. We've tried this on at least three cockroaches now and at least the decrease in spikes is consistent. This is exciting! And we clearly need a better method to quantify spikes! The worms were less encouraging. One worm completely stopped moving and spiking after the cayenne pepper. Another worm showed an increase in movement and an increase in spikes....but it is possible that the increase in spikes simply came from the increase in movement. After talking to Eric about the Daphnia, we have decided that, for the time being, we are out of the Daphnia business. This is sad because these arthropods are such appealing little creatures...but it is also a huge relief because we have spent so much time and money trying to keep the Daphnia alive and failing. For the time being we are going to focus on getting our assays that do work--trying to get them perfected before kits go out to teachers in March! The Daphnia looked great on Friday but many are dead today. Our plan was to experiment intensely on the Daphnia all week--and try to get some assays working. However, we have so few today that it doesn't seem worth starting. Daphnia are very frustrating. The bad news: Both refrigerated planaria are dead. I am not sure how to wrap my head around this as we have colleagues who keep this species of planaria in the refrigerator. I'm not sure what to try next. The good news: New Daphnia magna arrived! They are immature but look pretty happy. I fed them a small amount of Nannochloropsis (nanno)--a single celled green algae that they are supposed to like. I also put them into spring water instead of conditioned water. Fingers crossed that this works. The whole planaria placed in the fridge was dead and decaying this morning. This planaria was in a single well of a multi well plate--about 3 ml. I know that some scientists keep their planaria alive and healthy in the refrigerator....so it can't just be a temperature thing. I wonder if it is the rate of change from room temperature to 4 degrees Celsius. To test this, I placed two more whole planaria in the refrigerator--but this time, I one planaria is in 175ml of water and one planaria is in 800 ml of water. Also, the temperature in our lab is 24.5 Celsius and the temperature in the fridge is 4.5 Celsius. The fridge temperature is normal but the lab temperature is really quite warm for "room temperature." The planaria at room temperature all have eyes now! Amazing. Ten half planaria were placed in wells and ten planaria had eyes within four days. Interestingly, planaria in five wells actually divided into two planaria over the weekend--so 50% of our planaria split during this experience. I'm not sure how to explain this. Did we cut them more than once accidentally? Are planaria more likely to regenerate a new planaria if they've been recently cut in two? Are the extra planaria a result of being injured when we move them with the paintbrush? So many questions. In the five wells with two planaria, one has eyes and one does not. I also placed a whole planaria in the refrigerator to see if the temperature kills them even if they are not cut in half. The good news is that all of our Planaria at room temperature look good, as expected. The bad news is that all of our Planaria in the fridge are dead. The decay seemed to start at the cut end--instead of the cut closing and healing and regeneration starting, it looks like the cuts became infected. One way or another, re-growing our Planaria in the fridge is not going to work! We are thrilled to announce that we have two student assistants now working in the lab: Pranav Venkataraman and Luke Allpress. I am excited to have these two working on experiments so that Sowing the Seeds of Neuroscience can learn about neurological effects of medicinal plants on invertebrates even faster! Pranav and I started an experiment today to determine how quickly Planaria will regenerate at room temperature and in the refrigerator. My post from 09/04/12 indicated that we noticed Planaria regenerated much slower in the teaching lab compared to our research lab--and we think that is due to the fact that it was much colder in the teaching lab. We hope that our Planaria regenerate in two to three weeks in the refrigerator instead of just a few days! We'll keep you posted. I spent the day today working with the final 2012-2013 Neuroseeds consultant teacher: Darrel Tanaka of Hamilton International Middle School. We talked through all of the lessons and worked through a bunch of them: Plant extractions, planaria movement, planaria regeneration, Lumbriculus heart rate, bacteria, and the spiker box! It was certainly a busy, fun day. Here is a picture of Darrel with two of his favorite tools from today: the spiker box and the planaria. I am organizing all of the data from all of our experiments this week. This will enable me to see quickly (in a table) what herbs have been tested in which assays. Some of our assays are ready to go--the methods are clear and we have a few herbs that work well to make some change in our system! Other assays need a lot more testing. This table should help us prioritize our time! Eric and I spent the day taking photographs in the lab to use in our lessons! They are going to be beautiful. Here is an image of some of the dried herbs that we use in the lab--I think it is lovely. Each of these herbs is thought to have neurological effects! We have made decoctions of these herbs and are using them in our invertebrate assays--hopefully I'll be able to share some more results soon. Sorry that our blog has been so slow! I have been collating all the feedback we received from teachers and starting to revise our middle school lessons. Our Sowing the Seeds of Neuroscience Experiments went very well but in two cases, the results were different than expected--possibly because of temperature! This is a good reminder to me to replicate, replicate, replicate....and actually to replicate under a variety of conditions as our middle school students will not be working in the UW lab! Here are some details about how the results differed. 1) The bacteria grew much more slowly. This was no surprise as the research lab is really warm and the teaching lab where we had the workshop was freezing! Lavender and tea tree oil were still effective but, surprisingly, garlic was not! Was this due to temperature? Was it a problem with technique? Was it a problem with the garlic? The only way to find out is to do another experiment :) Next week, I am going to do the bacterial assay with plates both on the counter and in the fridge. Maybe bacteria are able to replicate in the presence of garlic if their metabolisms are VERY slow due to the cold. Or maybe the cold and warm plates will look exactly the same. We will see and I will let you know! 2) The planaria regenerated much more slowly. Again--as planaria are poikilotherms (exotherms)--their body temperature and metabolic rate will vary with temperature. In the freezing teaching lab, they regenerated very slowly. We cut them in half on Monday, and by Friday, we could see no difference. In our warm research lab, we cut them in half on Monday and can often see eyes by Friday. Slower regeneration will actually be helpful for our experiments because it will help us see if there are any differences in regeneration rates between controls (planaria in water without plant extracts) and planaria in water with different plant extracts. If regeneration happens super quickly, the difference might be just a few hours....while if regeneration takes weeks, the difference might be a few days. Again, I will try this and let you know! Before Eliza, our undergraduate volunteer, went back to college, she helped developed a way to test heartrate of Lumbriculus worms. She really worked hard to perfect the technique. Eliza is our chief "worm wrangler." We made sure that she taught us how to prepare the worms. The video below shows how to get a worm on a slide so you can watch it using a microscope. Using the lessons we created, the teachers made plant extracts and decoctions and experimented with chromotography, planaria, daphnia, Lumbriculus worms and bacteria. 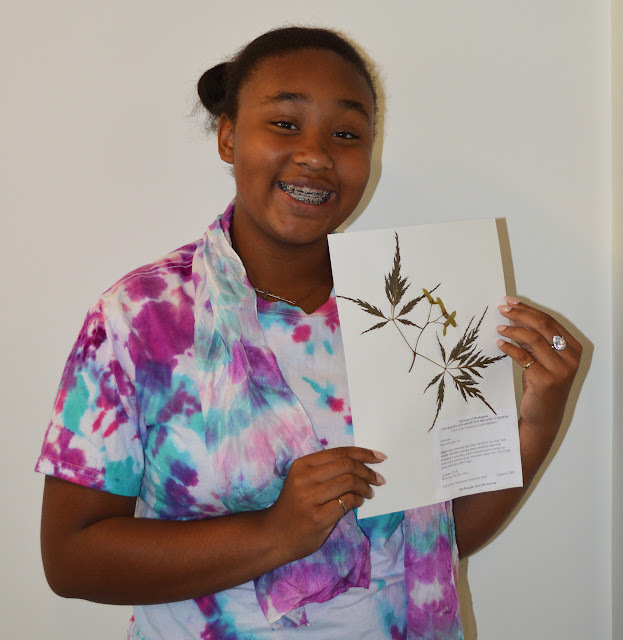 We also went on field trips to the University of Washington medicinal herb garden, Herbarium and Burke Museum. Most importantly, the teachers gave us feedback about how to improve the lessons. We will take the teachers' advice and revise our material to make it the best it can be. I am leaving for two weeks so will not be updating this blog. I'll be back on 7/30 with more adventures in science! In the meantime, check out this chromatography image! I ground spinach in a mortar and pestle, adding a little water to make it liquid. I put a drop of the spinach extract onto chromatography paper and used three different solvents to determine which solvent separated the spinach into the most obvious visual bands. I tested water (on the right), acetone (in the middle), and a combination solvent comprised of water, rubbing alcohol, and vinegar (on the left). Our volunteer Eliza has been testing the heartrate of Lumbriculus worms. We had a lot of trouble getting started with this assay because the worms crawl all over the slide! Eliza created slides with five layers tape around a very skinny channel....the worm fits nicely in the channel and then can't move too much. The pulse rate in 60 seconds ranges from 16-20. It is pretty easy to count. For the past few days, Eliza has been perfecting the methods we will use to test herbal extracts on these worms. Now she is trying the extracts. If you want to see these worms, check out the update below from 6/13. No data yet but I'll update whenever we have breaking news! Whoa. The fresh crushed garlic plate looks like a negative control. NO BACTERIA GROWING AT ALL! So cool. Clove and tea tree essential oils worked about as well as they did before. Nothing else shows promise....bacterial lawns, just like the positive control. Interestingly, the 10% garlic tincture (5 g garlic in 50g in water) that Eric made in February didn't inhibit bacterial growth at all. It still looks good and smells extremely garlicky....so we thought it would probably prevent bacteria from growing. I wonder if it failed to do so because garlic tincture isn't a good method or if garlic tinctured back in February has lost its antibacterial power? I think I'll test this hypothesis by making a new garlic tincture and seeing if that works to inhibit bacterial growth. Also--we got more Daphnia magna from Carolina. They are so much bigger than the Daphnia that we were using from Lake Washington. I wonder if they will respond the same way to the different plant extracts...? One more thing to test. Today Eric and I worked with a new volunteer in the lab, Eliza. We did the movement assay with Planaria instead of Daphnia. We learned a lot. The key things we learned are: 1) This experiment is MUCH more consistent with Planaria. Their range of movement seems much narrower and their response to a plant extract seems to be more similar across individuals. 2) Extracts don't necessarily have the same effects on Daphnia and Planaria. Tobacco extract definitely slows both to stopping, quickly. Green tea sped up the Planaria but slowed down the Daphnia. Actually, almost everything slowed down the Planaria....and most things did speed up the Daphnia movement. Interesting. Check out the video below of the Planaria movement. It is so cool to watch them move through the squares. We would love it if you count the number of squares that the Planaria moves through and share your results by taking this survey. Please count a square whenever the Planaria's whole head enters the square. How many squares did this Planaria move through? Today I started a bacterial assay again. I am still testing M. luteus, but this time, I tried some other plant extracts: garlic tincture, fresh crushed garlic, fresh crushed onion, fresh crushed ginger, dried crushed ginger, cayenne pepper, as well as clove and tea tree essential oils. PS: It is so much fun to smash garlic, onion, etc in a mortar and pestle. I think I'll get one to use in my kitchen at home! The zones of inhibition are smaller in some cases after the weekend. The positive control, negative control, penicillin and clove look the same. The Tea tree has a tiny zone of inhibition now--maybe 1mm around the disc for a total of 9mm. The lavender looks exactly like the positive control...so though growth may have been slower with lavender, after five days, the bacterial lawn looks the same. Here are some pictures of the M. luteus plates which show the positive control with the bacterial lawn, the negative control with no bacteria, the zone of inhibition on the clove, and the almost entirely bacteria free penicillin plate. The circles in the middle of all of the plates are filter paper saturated with the plant extract (or penicillin). Today we have visible growth of bacteria (a nice, thick lawn of bacteria)! And we see areas surrounding the filter paper discs with no bacteria--suggesting that the plant extracts and antibiotics prevent M. luteus from growing. So cool. Negative control (no bacteria): no growth. This is GOOD because it means the bacteria we see on the other plates is really the M. luteus that we are testing! Lavender: no zone of inhibition--there is bacteria everywhere on this plate, but growth is lighter than in the positive control. Eric and I spent the whole morning testing different plant extracts to see if they affect Daphnia movement. We tested fourteen different extracts. Only a few were really obvious: Tobacco, green tea, and kava kava all had substantial effects...either slowing them way down, speeding them up, or both. One key thing we learned are that variation between animals is HUGE! In water, in one minute, individual Daphnia moved over anywhere between 8 and 40 squares. Once we added an extract, even bigger variation was observed! Check out the video below and then take our survey to let us know how many squares you think this Daphnia moves through! Please count the square whenever the Daphnia's whole body enters the square. How many squares does this Daphnia move through? We are still working to figure out the best methods to use for chromatography. We are using a variety of different solvents to separate plant extracts into component chemicals. Today I tried two things: I tried a new method of extracting plants and I tried doing the chromatography in test tubes instead of beakers. Both worked beautifully! The test tubes allow us to use long thin strips of filter paper as our chromatography paper...in the test tubes, the paper doesn't bend or "melt" into the solvent....which is key! Also, I used a mortar and pestle to grind up my plant (red cabbage and spinach leaves) with just a little ethanol. Then I used a pasteur pipette to put just a drop onto the filter paper. This worked at least as well as the coin rubbing method and better than using the decoction. Awesome! Another assay worked out. Well...we don't know what medicinal herbs will work best. Spinach, ivy, and red cabbage all work well, and students can figure out which medicinal herbs they are interested in checking out. As far as bacteria go---no visible growth yet. I went back to the drawing board today with the bacteria assay. We bought Micrococcus luteus from Carolina Biological. M. luteus is safe and grows well at room temperature. I think it might be better than our planaria water because it is a controlled, single bacteria. Today I poured plates of tryptic soy agar and then used sterile swabs to put a tiny bit of the M. luteus onto all of the plates, and then rub it around really good. The goal is to get a plate covered with bacteria (called a lawn). This will take a few days to grow. On some of the plates, I placed filter paper saturated with different chemicals--to test whether they prevent the growth of the bacteria. I tested: clove oil, tea tree oil, lavender oil, and penicillin. Here is one way to preserve fresh leaves: laminate them! Today all four Daphnia cultures have Daphnia in them....most with lots of eggs! Surprisingly, they do not look like the same species of Daphnia! The carapace is more angular and, though both species have a "spike", it is in a different place. We'll post some photos of the two Daphnia here soon. I also started cultures of Lumbriculus worms today too. We will use them to see how medicinal herbs change their heart rate. We put them on a microscope to watch their blood flow today, which was REALLY cool. However, they move around like crazy and we are experimenting with ways to keep them still so that we can watch their blood flow and count the pulses. We tried putting wax on the slide and making a small channel for the worm--but they still moved quite a bit. We also tried using a cover slip. This was great at keeping them still but may have killed the worm. Check the video out below of blood flow in Lumbriculus. Today our "Daphnia" cultures still do not have many (any?) Daphnia but lots of other critters seem to be hatching out of "resting eggs" at the bottom. I think that we have Cladocerans and Copepods so far. The water we are using for the Daphnia cultures is straight out of Lake Washington, so it makes sense that we might be culturing more than just Daphnia! Hopefully more Daphnia will hatch soon. I don't see any Daphnia yet in our beakers, but there are definitely some freshwater invertebrates in there. Maybe cladocerans. Here is a video of the little guys. Eric took this video using our new microscope camera! Eric and I also worked on a cockroach leg in the spikerbox today! We tried a new mini oscilloscope which has potential. It worked but the connection between the oscilloscope and the spiker box was a bit persnickety...and there is a bit of a delay. Regardless, it looks like something we might be able to add to the Science Activity Boxes to make the spikerbox even cooler. Today we used a cockroach leg on the spiker box. As usual, there was a lot of background neural activity that we could see on the oscilloscope and hear through the speakers. When we touched the cockroach leg, the neural activity would really take off--we heard lots more clicking and saw more spikes on the oscilloscope. We aren't sure how we are going to test our plant extracts using this system. Today we tried injecting a local anesthetic into our cockroach leg. We used 2% lidocaine HCL. When we injected the lidocaine, we almost immediately saw the background neural activity stop--no more clicks and spikes. When we touched the leg, the neurons still fired and we could see and hear this....but the background was very quiet. After a few minutes, the leg stopped responding to touch also. This was GREAT because it showed "proof of concept." Now we just need to find a plant extract that works as well as lidocaine! I've been reading up on Daphnia! It sounds like we should have a 1 gallon container for up to 100 Daphnia. A gallon is 3785 ml--almost 4 liters. We probably had more than 100 Daphnia in about 800 ml of water! The Ward's Natural Science Daphnia culture directions say this, " Be careful not to allow overcrowding in your Daphnia cultures. Overpopulation can cause a culture to fail. If necessary for the health of the culture, pull Daphnia from the containers and use for subculturing." It sounds like giving our Daphnia more room in addition to the Nanno might be the answer! I will go to the pet store today and buy some aquaria! Another cool thing is that Daphnia eggs don't all hatch right away. Some eggs develop a thick extra shell called an ephippium. Because of the extra shell, these eggs (called ephippia or resting eggs) are able to survive for a long time under poor conditions. They can even survive if the pond dries up or if they get frozen! Hopefully, some of our ephippia at the bottom of the beakers will hatch. Following Ward's manual, I poured out 90% of the water in the beakers, keeping mostly the stuff that has accumulated on the bottom. I then filled up the beakers again with Lake Washington water, and fed the beakers with Nanno. If we had ephippia, they should hatch in 4-8 days. The Daphnia crashed again. They have looked awesome since we fed them the Nannochloropsis. The colony was dense with large and small Daphnia, and they were clearing the water when we fed them Nanno in just a few days. I'm learning so much about how to take care of Daphnia! I'm not sure if the problem was that I over fed them on 5/23, or if the colony was just too dense and I should have split them into another beaker. When I start another Daphnia culture, I will have them in two or three beakers and treat the beakers differently---this way I'll be able to learn what works best for our Daphnia! Eric and I just returned from the NIH Science Education Conference in Bethesda, Maryland. It was wonderful to hear about the goals of NIH science education, and to meet with so many people working on similar projects! It was also great to present our poster at the poster session and hear feedback about ways to collaborate with other people to improve our science and teaching. I fed the Daphnia some of the Nannochloropsis and they seem to like it! Lots of babies (usually a good sign), and they are swimming around the beaker like crazy! As soon as I bring more non-iodized salt into the lab, I'll start another batch of brine shrimp and see if feeding them is, in fact, the secret. Two exciting things have happened in the lab this week. 1) I talked with the person who runs the zebra fish lab at UW. They feed the zebra fish brine shrimp, so I figured that they would certainly know how to take care of brine shrimp. It seems as though there is a simple solution to our problem with brine shrimp dying. It is so obvious I am a bit embarrassed that I did not think of it. They are starving to death! He gave us some concentrated Nannochloropsis--which is a green algae that is energy rich and tasty for animals like brine shrimp and Daphnia. 2) We have our bacterial assay figured out. We use small petri dishes (that I call plates) with tryptic soy agar. Once we've poured these and allowed them to cool and harden, we use a cotton swab to innoculate the plate with bacteria from the Planaria water. Simply taking a cotton swab, dipping it into the Planaria aquarium, touching the plate with the swab, and then trying to swab all over the plate, leaves us with AWESOME growth after a few days. Even better, if we put a plant extract on a small circle of filter paper (from a hole-punch) in the center of the plate, we get a big ZONE OF INHIBITION where no bacteria grow. The best plant extracts seem to be tea tree oil and clove oil. In some cases, even a week later, we see NO GROWTH on these plates. This is even better than the bleach! Check the photo out below. The plate on the top is one control--it was inoculated with bacteria, but no plant extract was tested. It is covered with two different types of bacteria. On the bottom left plate, the small circle of filter paper was saturated with tea tree oil--and no bacteria appears to be growing. On the bottom right plate, the filter paper circle was saturated with bleach--this plate certainly has less growth than the control, but more bacteria than the tea tree oil plate. Isn't it cool that the tea tree oil seems to be even better than bleach at preventing bacterial growth? The nutrient agar plates are growing bacteria well when sampled from the Planaria water. Last week, I tested a bunch of plant extracts to see whether they would inhibit bacterial growth. As a control, I used bleach. No surprise, the bleach worked really well at inhibiting bacterial growth..what this looks like is a big clear spot in the middle of the plate of bacteria. So no bacteria in the middle, where the bleach was placed. Lavender, clove, and tea tree essential oil all looked like they worked to some degree. I repeated that test today. I also have started my Planaria regeneration assays. Last week I tested four different herbal decoctions (made from boiling the herb in water for 30 minutes to one hour) to see if the Planaria showed different rates of regeneration. I tested Astragalus, Centella (gotu kola), Hawthorne, and St. John's wort. All of these herbs are used in different cultural traditions (Western herbal healing, traditional Chinese medicine, and/or Ayurvedic medicine) to help wounds heal. I found out that some concentrations of St. John's wort killed the Planaria and that regeneration was observed in all cases--even in the no herb controls. After 5-7 days, the tail end of the Planaria grew a head with eye spots and the head end grew a tail! We wanted to measure the growth but it seems challenging to slow the Planaria down enough to measure, to determine where to measure, and to decide how to measure even if we could figure out the other two issues. Instead, we are going to run this assay again and check the Planaria every day to see if eye spots have appeared. So much has happened in the lab since I last updated. The bacteria bioassay is working well. The milk plates grow bacteria from yogurt really well--and if I color the plates bright blue or pink with food coloring, you can see the bacteria too. Even more exciting, the nutrient agar plates grow bacteria from environmental samples well. Surprisingly, the keyboard and bathroom swab doors weren't that bacteria rich. The Planaria water on the other hand is loaded with bacteria! These plates are COVERED with bacteria after 24 hours. Next I'm going to start testing some of our plant extracts on these plates to see if they prevent the bacteria from growing. Fun fun. Here is a picture of all of the colorful plates I'm working with: Milk plates with different food colorings and the nutrient agar plates. Came in today after a week away and found that both the brine shrimp and the Daphnia are dead. I'm feeling frustrated with our inability to keep the research animals alive! The milk plates I made definitely have bacteria growing on them but it is hard to see. Today I am trying a new type of agar to see if we can get nice thick bacterial growth from "environmental samples." To get environmental samples of bacteria, I simply sampled the environment: one swab from my keyboard, one swab from the bathroom stall door, and one swab in the Planaria water. We'll see what happens! I'm glad I split the brine shrimp into two containers: the ones with the airstone are alive but the ones without have died. I also am trying to grow the bacteria that is in yogurt on petri dishes. I used milk instead of water to mix with my agar (which hardens the milk, like jello) because the yogurt bacteria (Lactobacillus acidophulus) eats the sugar that is in milk (lactose). I'm not sure what color these bacteria are so half of my petri dishes are white and half I colored with blue food coloring--check out the blue ones below! I removed the old shells from the brine shrimp and put the little guys in two separate aquariums. One has an air stone and one does not. I also worked on paper chromatography and got great results with rubbing ivy onto the filter paper and then using isopropanol as a solvent. The pigments from the ivy traveled up the paper in two lines: a green line (which is the chlorophyll) and a yellow line (which is carotene). The pictures below show the three steps: 1) Preparing the filter paper by rubbing the pigments from ivy leaves onto the paper with a coin, 2) putting the filter paper in solvent for the chromatography to occur, and 3) the results clearly show how the line of pigment we put on with the coin was separated into a yellow and a green band. This worked best using isopropyl alcohol as a solvent. So cool!! The brine shrimp have hatched again. Maybe we can keep these alive for more than a few days. The brine shrimp look great! They are very active. Here is a video of the little guys. We started a new culture of brine shrimp. This time, we used water from Lake Washington and we added a bubbler (for oxygen) and a light. I hope these brine shrimp hatch! We are still experimenting with the spiker box. We only have three cockroaches left so today we bought some crickets to determine whether we can see neural activity in cricket legs using this device. Results: Yes, we can see neural activity from the cricket leg but it was much harder to set up. Cockroaches are better but crickets will do in a pinch. The brine shrimp did not hatch. I wonder what is wrong. We have started to experiment with the "Spikerbox," an inexpensive device that can be used to record neural activity from cockroach leg nerves. Here is an early attempt; listen to the increase in spikes when the leg is touched. We have begun cultivating planaria and daphnia in the lab. These will be test subjects for the experiments. Planaria can be fed little pieces of raw liver, but they only need to eat every couple of weeks. Daphnia are common pond crustaceans. They are about the size of a pin head. They eat algae and yeast. 2 Happy New Year from the Neuroseeds Team. If you are looking for a healthy New Year's Resolution, adding turmeric to your food might be a good one! 3 Can chocolate be good for us?